How to make deliciously thin, buttery, and easy crepes inspired by Paris, France right at home. The flavor and filling options are endless! Can be made ahead of time. In a blender combine all the ingredients and blend for 10 seconds. Refrigerate the batter for 1 hour or up to 48 hours. Set a 9-inch nonstick skillet over medium heat. Add enough butter to grease the entire pan. Add a 1/4-cup of batter to the center of the pan and immediately but gently tilt and swirl the pan to spread the batter out evenly. Cook until the crepe begins to bubble and is lightly browned and the batter is set, about 45 seconds to 1 minute. 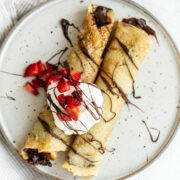 Use a small spatula to lift the crepe up and off the pan then quickly flip the crepe over. Don’t worry if you don’t flip perfectly, you’re just going to roll the crepes up anyways. You just want to be sure you don't create any large holes in the crepes. Use your fingers quickly if necessary to get a sturdy grip on the crepe before flipping. Cook until the other side is lightly browned and set, about another 10 seconds. Lay the cooked crepes flat on a plate. Continue the process, greasing the pan with more butter as you cook each crepe, until the batter is gone. Serve or store in an airtight container in the fridge for up to 2 days or in the freezer for up to 2 months. Thaw frozen crepes before gently peeling apart.